In our quest for organic fertilizers for our garden, horse manure as fertilizer came up in several discussions with DH. I've heard folks rave about the effectivity of aged horse manure to produce robust and vigorous garden plants that help boost flowering and fruiting. Along with horse manure, molasses as a fertilizer amendment often came up in internet forum discussions. So where else to find horse manure and molasses? In places where there are horses, of course! 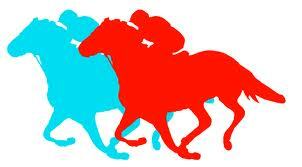 And the horse racetrack or hippodrome is definitely one place. The crucial landmark to find when going to the San Lazaro Leisure and Business Park is the Police Station Checkpoint in Carmona, Cavite. This is if you're coming from the South Luzon Expressway or SLEX. The Carmona Checkpoint is a major checkpoint in that it is situated in an intersection. 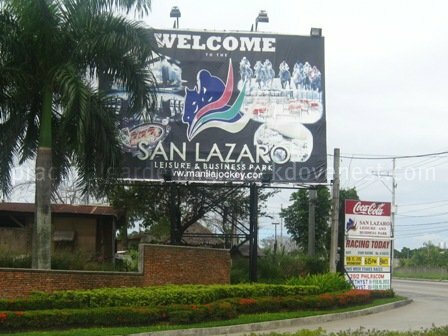 The San Lazaro Leisure and Business Park, sometimes called San Lazaro Leisure Park and Casino, is roughly 400 meters after passing the Carmona Checkpoint. There are two ways to reach the San Lazaro Leisure and Business Park from the SLEX. One is via the Southwoods exit and the other via the Carmona exit. Both of them will end up near the Carmona Checkpoint. The red arrow in the map below is via the Southwoods exit and the green arrow is via the Carmona exit. Exit the SLEX at the Southwoods tollgate. At the first intersection, turn right. You'll see the Sto. Nino de Cebu Parish, the Colegio de San Agustin school of Binan Laguna and a part of the Splash Island Resort compound. Follow the signs that direct you to Governor's Drive. If in doubt, just follow the most of the private vehicles because they are more likely taking this route as a shortcut. You will be passing a private subdivision and, along the way, you'll see vacant lots that are planted to vegetables. Still following the signs, you'll reach the perimeter of Southwoods. You'll notice the wide and tree-lined street called Congressional Rd. Follow the signs until you'll reach a major intersection where public vehicles like jeepneys pass. The intersecting road is Governor's Drive. Turn right at this intersection. You will immediately see the Carmona Checkpoint at the left. Exit the SLEX at the Carmona tollgate. You'll reach an intersection and turn right at this intersection to go to Carmona, Cavite. You're now in Governor's Drive and continue on this road until you'll see a small rotunda on the left. PLDT (right), People's Technology Complex gate (right), 7-11 in an intersection with traffic light (left), Waltermart inside Macaria Busiess Park (left), Caltex gas station (left). Slow down when you see the Carmona Checkpoint at the left. The following map shows the Police Station Carmona Checkpoint. The red arrow above shows the route coming from the Congressional Road if you passed by the Southwoods Exit. The blue arrow shows the route coming from Governor's Drive if you passed by the Carmona Exit. The green arrows show the route going inside the entrance of the access road leading to the San Lazaro Leisure Park (Hippodrome) labeled as "A" in the map. Here's an interactive Google map showing the San Lazaro Leisure Park. Use the navigation keys to scan the area. 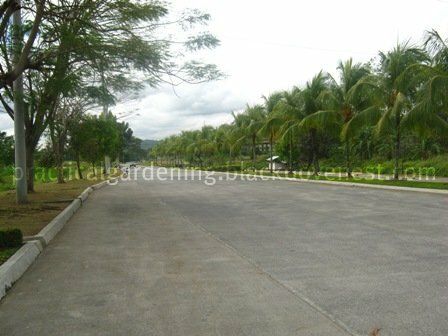 From Governor's Drive, enter this wide and landscaped access road. 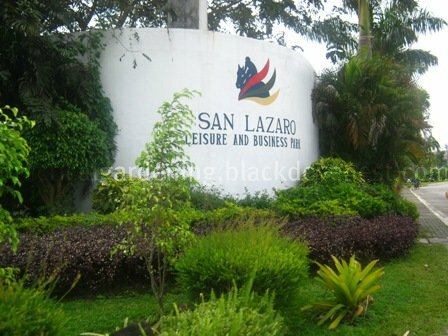 Drive the long stretch of about 1.5 kilometers until you reach the main entrance of the San Lazaro Leisure park. Upon entering the main entrance, you'll see this marker near the casino. 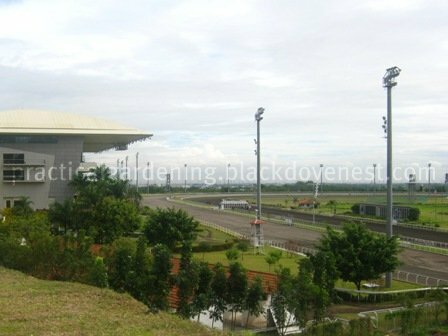 The photo below shows the hippodrome / horse racetrack near the casino of the San Lazaro Leisure Park.